One of the sweetest souls we have met! Ashley brings a bright light & beautiful talent to our creative team. Born in Cranbrook, she has been an Okotoks native ever since she was little. With a true love for the mountains (& her favorite way to get through winter), you can easily find her up on the hill snowboarding the days away. After joining the Avenue Beauty team just over 4 years ago, it has been incredible to watch her grow & to see her share her creative designs with so many beautiful clients. She most recently added to her skill set makeup artistry, which she completed 2 years ago & continues to grow her styling skills through photo shoots, collaborations and education. While continuing to work at a barber shop (going on 7yrs), this gives her a wonderful balance of the different areas that hairstyling provides. Ashley has a true passion for bridal beauty & loves spending the mornings with brides & their bridal party. It is a beautiful and special atmosphere, and she thrives on being able to make each client look and feel their most beautiful self. Creating connections not only with clients but other local vendors, Ashley is grateful to where hairstyling has taken her so far, & she can’t wait to see what this year brings. We are excited for each one of you to meet this kind and beautiful soul & to be able to experience her talents in beauty! Oh and by the way- she always has the most beautiful and fun nails—be sure to take a peek at her current look when you meet her! A talented & creative artist with an adventurous soul. Melody’s love for makeup began in high school where she would model for hair shows & competitions. Being so intrigued by what the makeup artists were creating, her curiosity led her to Vancouver 10 years ago where she completed her makeup artistry course. What she loves most about doing makeup is having the opportunity to bring out every clients natural beauty, & to enhance their unique features. Originally from Hungary, Melody is active in the local Hungarian community, including being a part of a Hungarian dance group. This has also allowed her to utilize her incredible talent by doing makeup for the performances & events. She is a huge lover of travelling, going to the theatre, enjoying coffee with friends & spending time with her cute lil’ pup Hugo. As a bride-to-be herself, Melody has an amazing eye & passion for bridal makeup. Through her years of being an artist, specifically in bridal beauty, Melody has become so versatile in the looks she creates- everything from a soft glowing natural look, to a more bold, dramatic look and everything in between. 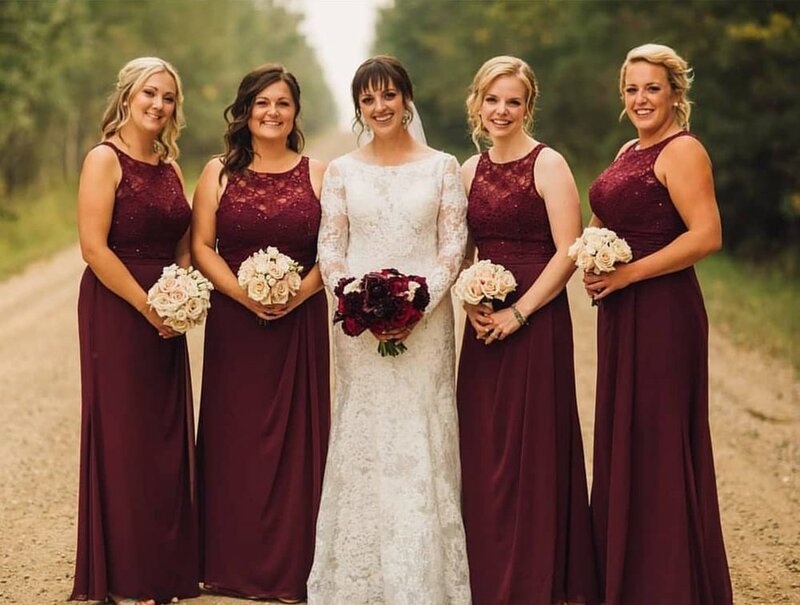 During her time here at Avenue Beauty, she has inspired us all & continues to do so as we watch her in her element and see her artistic skills flourish with each and every wedding season. We hope you get a chance to meet Melody- to experience her talent and to hopefully chat about some incredible places in the world. We can’t say enough amazing things about this beautiful lady. She is so full of love, positivity, drive and incredible talent. Kelly has been apart of the Avenue Beauty team for well over 6 years and we have loved every moment it. Her training started back in her native Chicago where she worked with Stewart Talent Modelling Agency in the commercial print department. From there, her talents took her doing photoshoots, weddings and reality tv. As a cast member of the Bachelor in 2003, she was able to continue her practice on her cast mates as well as for her post appearances including The View, Oprah and Ellen. Once meeting her amazing husband (not from the bachelor), life took them over to Europe for a bit of time and she was able to continue her artistry on fashion shoots, public relation tours, red carpet events and personal styling. Her excitement for doing makeup, hair & fashion stems from using her beauty skills on a client’s outer beauty, which in turn makes that individuals inner beauty soar from within. Kelly loves working in the Calgary market around her family and skincare business. As a mother of 2 gorgeous girls, she is an incredible example to not only them but so many others. We are continually inspired by her balance of her personal life & work life, seeing her continually grow in so many ways and seeing her create so many beautiful looks! If you have had the delight in working with Kelly, you can certainly agree that her love of the craft, infectious smile & laugh, and amazing talent shines through at every booking. We are beyond lucky to have Kelly on our team and can’t wait for you to experience her incredible talent. We are so excited to welcome back to YYC the gorgeous, blonde beauty, Miss Kelsey! Originally from Kelowna, Kelsey has always been a creative soul. When she was younger, she was unsure of what the future would hold for her as an artist and if that was something she could pursue as a career. But once she got into makeup, she realized she was able to be extremely creative with this form of medium, and her love and passion for being a makeup artist blossomed from there. She absolutely loves making people feel great about themselves and being able to show them ways makeup will help them feel confident in enhancing their own beauty. Kelsey graduated from Blanche MacDonald in 2006, had the opportunity to work at MAC Cosmetics for almost 10 years & has been freelancing for 13 years. Her favorite thing about doing makeup is that she helps her clients feel amazing, beautiful and fierce about themselves. She absolutely loves makeup and any chance she can get to play she is up for it! In her spare time, Kelsey loves to be outside (weather permitting!) She enjoys hiking, snowshoeing, bike rides and anything on the water or a beach. She is a HUGE concert fanatic (especially if it is country! ), so you can definitely find her at most concerts or festivals that comes through town or around the area! Kelsey has had the honor of being a bridesmaid 9 times (always a bridesmaid, never a bride?! ), so we figure between her experience in that role and all the wedding parties she has glammed up as an artist, she is a wealth of knowledge for all things wedding! We hope you have a chance to see her incredible work and to have the opportunity to work Kelsey. She is once of the sweetest souls, has the most contagious laugh and will definitely make you feel your most beautiful self with her makeup applications! 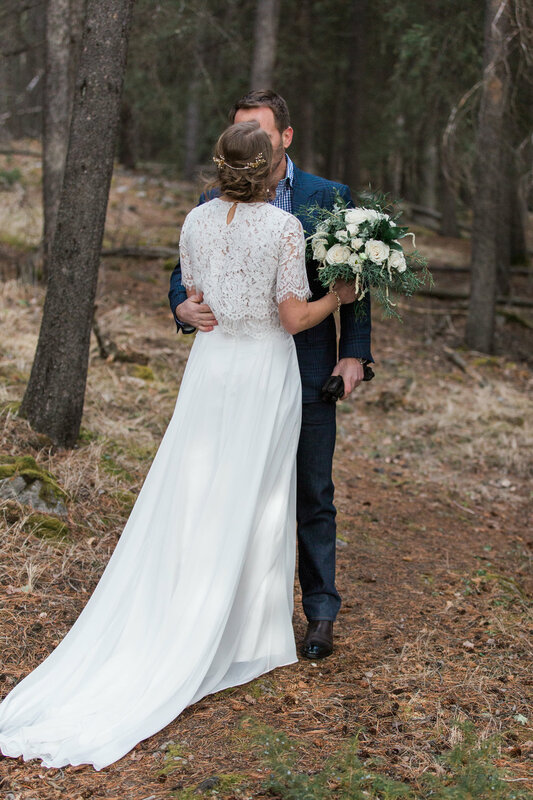 We were so honored to be apart of this beautiful, unique & intimate elopement that was featured recently on Confetti Wedding Magazine Blog. 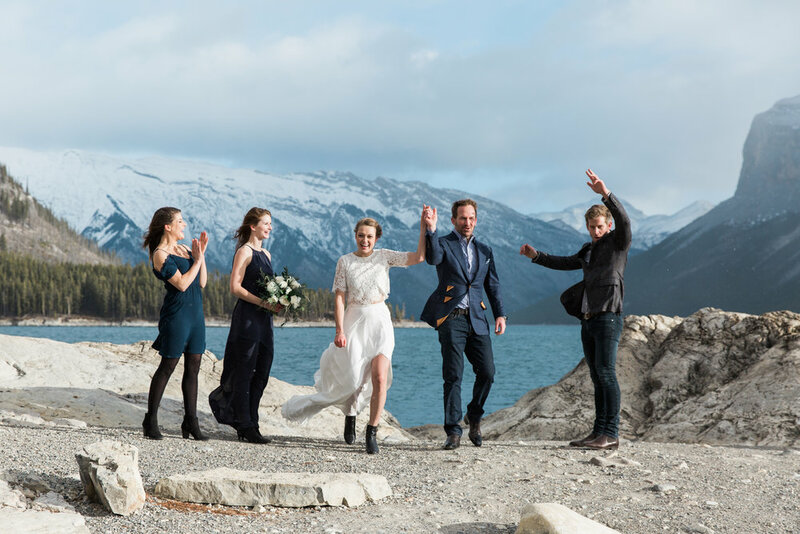 The couple’s ceremony was a beautiful escape back to where they first met, surrounded by the stunning Rocky Mountains. 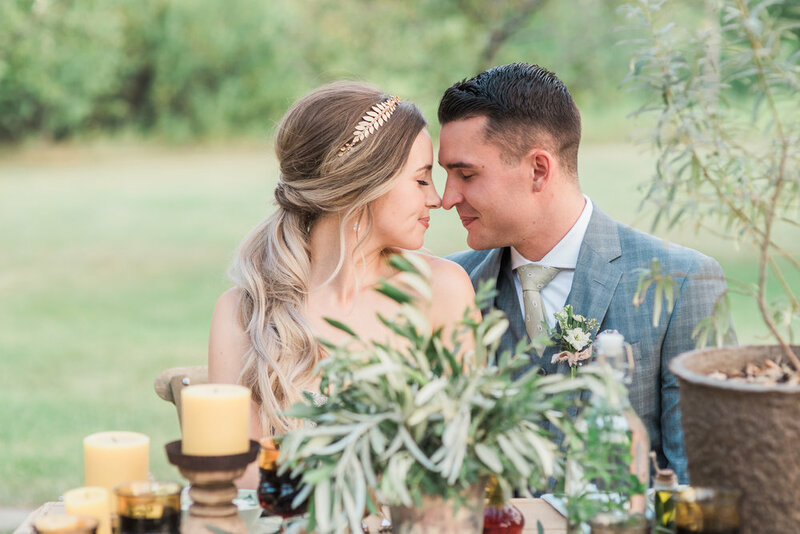 Kassandra’s style was very soft & romantic, so we tucked her hair into a textured, low bun & adorned it with a gorgeous gold hair piece from Joanna Bisley Designs, To compliment her soft, feminine dress, we kept her makeup light & polished with shades of pink & champagne. 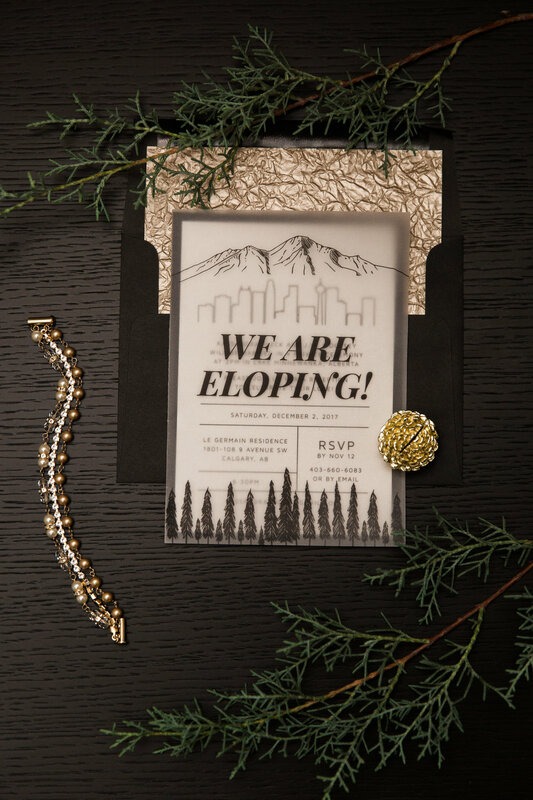 Once the couple said “I DO’, they headed back into the city to celebrate with their friends & family at a quaint reception in their downtown home. We dialed up the glam factor for Kassandra’s look by taking her hair down for some vintage inspired waves and by popping on a bold lip & adding in some depth to create a soft smokey eye. The team that made this day come together was absolutely incredible and they truly continue to inspire us. Huge thank you to each and everyone of them, and also to the beautiful couple who allowed us to be a part of their special day. We hope you enjoy a peek at the wonderful moments captured! When community comes together, beautiful things are made! We had the opportunity to be a part of the design team for this intimate, cozy couples photo workshop that brought in a beautiful handful of local photographers, giving them the opportunity to shoot an intimate, in-home styled shoot with a real life couple. The setting was cozy, the mood so chill & the photos captured were so true and authentic. As we have said in the past, it is so incredible to be apart of these events- connecting with other creatives and seeing the perspective of the day through so many eyes is so incredible. Take a peek below at the wonderful design team, as well as some beautiful photos captured from the workshop! It was the perfect summer day in YYC for the vision of this styled photoshoot to come to life. 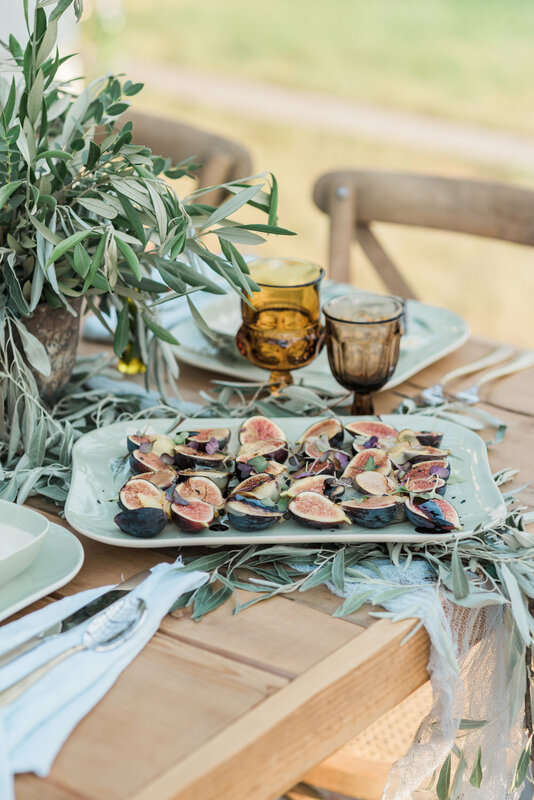 We are beyond grateful to have been on board this incredible styled shoot that was inspired from the old world beauty of Italy- showcasing its beautiful earthy colors, soft hues, textures & timeless elegance. Our location was in the beautiful Baker Park located in Bowness – it created the perfect back drop full of lush greenery. The inspiration for the brides hair & makeup was ‘elegant simplicity’. We wanted to create a style that was elegant yet effortless, and one that showcased & complimented the stunning hair piece designed by Joanna Bisley. 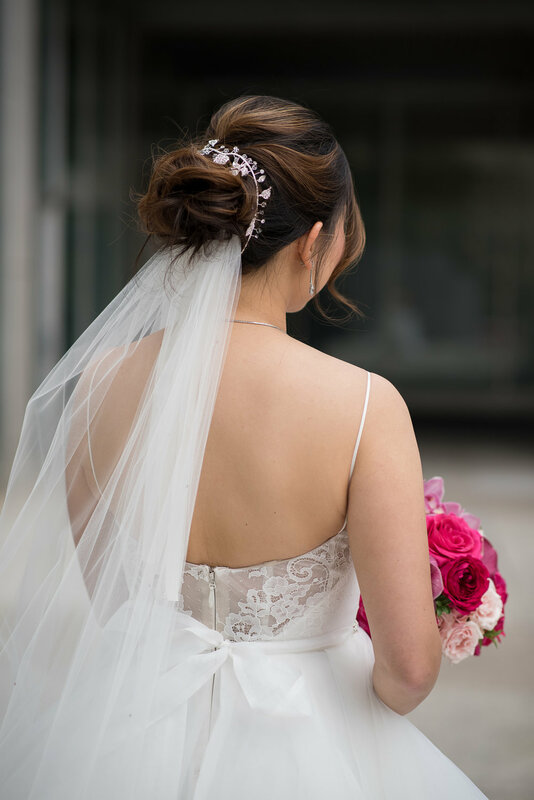 Nikki has gorgeous locks to work with, and with a softly textured, low ponytail with some detailing in in the back, we felt it was a perfect fit with the accessories and the gorgeous gown. 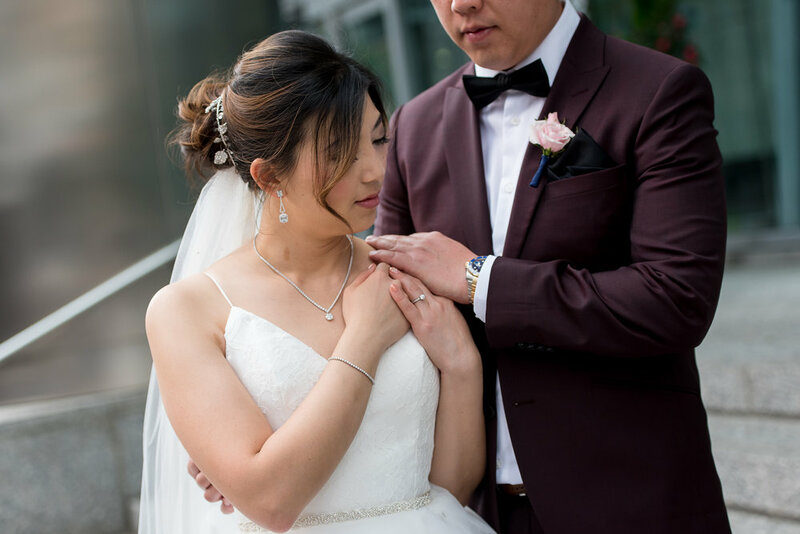 We wanted to keep her makeup light and fresh to compliment the details of the hair & softness of the dress and to ensure it fit with the light and airy summer style. Being able to do a collaboration of any size is such an inspiring & beautiful project for us. It allows us to see other amazing vendors in their element, allows us time to chat as often on wedding days, we don’t have those moments and allows us to expand our creativity in different styles/applications. We encourage you all to check out all the beautiful work of the vendors below, and please enjoy the little gallery below of some more from this incredible shoot! We have been on a bit of a hiatus from our blog since our new website launched last year. It has been a year of updating our marketing, social media & being busy with all our beautiful weddings, incredible clients & fun collaborations. It has also been something quite intimidating to jump back into as writing has always been a bit intimidating. It is so important to share our teams incredible creative journey and showcase our beautiful & talented team, so here we go on a new adventure! Thank you so much for all your patience while this part of our site was on hold & for all your support on our social media sites! We are beyond grateful for having such an incredibly support community in this amazing city! I am going to be sharing our teams most recent work as we create it this year, but also sharing some past content that we are so proud of! 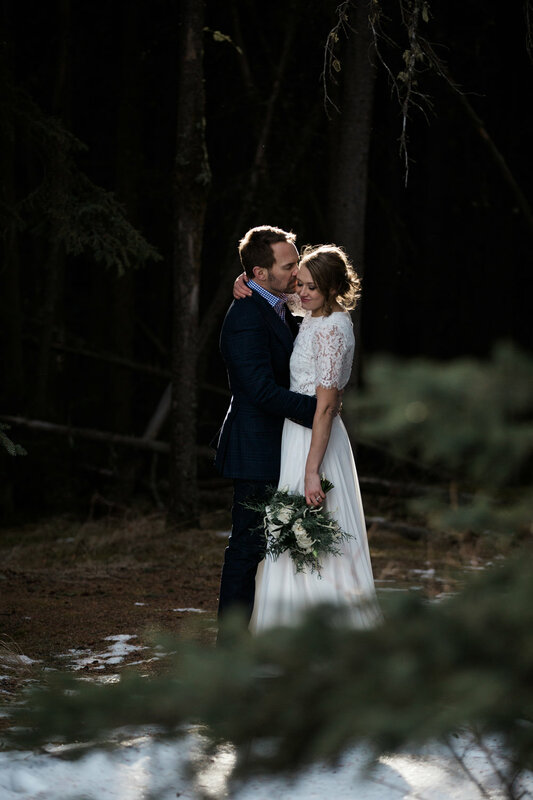 That will include some real weddings with our beautiful brides, collaborations with some talented local YYC vendors, some bits about our amazing artists & stylists & all things beautiful. I hope that you enjoy our work & hope to have the opportunity to work with you one day!